For Christmas, I was gifted a very nice Wacom. Which needless to say I'm excited about it. Over the past few days I've been making an attempt to learn a bit more about how to use it. The picture above was my first drawing done for this blog wholly with the Wacom. I've used the GIMP program before but with a mouse and usually post pen and paper drawing and some scanning. Disney is not a subject I prefer. In fact, Disney is one of my least favorite cartoon/illustrative companies but they are big and recognized and have plenty to pull from. 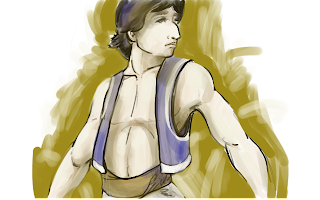 That in mind, here is my quick sketch version of Aladdin. I wimped out and avoided the hands or any serious dynamic pose...but I'm very open to feedback on how better use the tools or on concepts. A huge thanks goes out to Ian for such an amazing gift! !